Russia and Cuba signed 10 agreements to expand cooperation in energy, transportation, culture, industry and healthcare during a one-day state visit by Russian President Vladimir Putin. 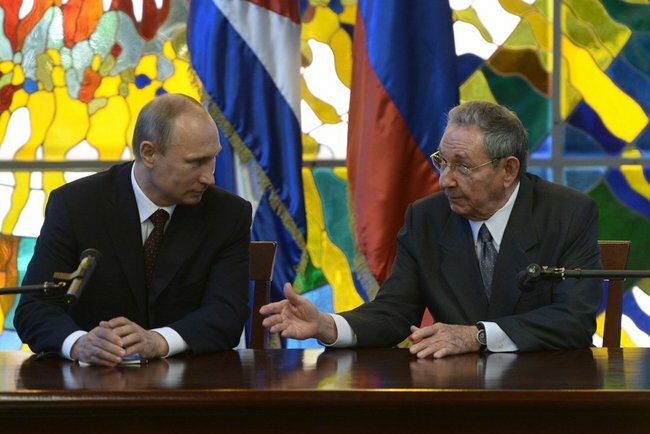 During talks with Cuban leader Raul Castro, Putin said “We will provide support to our Cuban friends to overcome the illegal blockade of Cuba”. Russia’s state-run oil firm Rosneft and Cubapetroleo (Cupet) signed a cooperation agreement in offshore oil exploration. Russia’s Inter RAO Export company also inked a deal to build four 200-MW stations to boost the generating capacity at a Cuban thermoelectric plant. Ahead of Putin’s trip, Moscow wrote off 90 per cent of Cuba’s debt to Moscow. The remaining 10 per cent of the debt will be restructured and paid over the next 10 years, and the money will be reinvested into the Cuban economy. Cuba owed Russia nearly $32 billion, most of it originating from Soviet loans to a fellow communist state. In Cuba, Putin met with former President Fidel Castro and held an hour long discussion on international politics and bilateral ties, said a Kremlin statement. From Cuba, Putin leaves for Argentina and then Brazil to attend the 6th BRICS Summit in the Brazilian cities of Fortaleza and Brasilia.